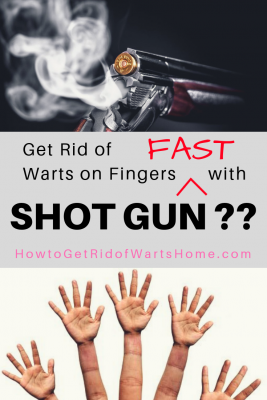 How to Get Rid of a Wart on Your Finger: With Shotgun? You know shotgun is not an viable option to remove your finger wart. You would most likely think it is just a stupid theoretical question that ain’t gonna happen in real world. According to Daily Mail UK, 38-year-old British man found his stubborn wart hurting, and did not go away after trying all sorts of things. He then took some beer, pulled out his 12-gauge Beretta shotgun, and… Bang! The good news – he achieved the objective. The wart is gone and won’t be coming back. The bad news – he lost the upper part of his left hand middle finger, then he was given a 16-week suspended sentence and community service. The internet community’s response to this story of Sean Murphy was overwhelming, with various alternate warts treatment recommendations and… interesting comments. What is Wart on Finger… That Triggered the Bullet? The type of wart most commonly found on the fingers or hands is the common wart, also known as verruca vulgaris. Like any other wart, finger warts too are caused by the highly contagious Human Papillomavirus (HPV) that can get transmitted to one’s self when direct contact with wart, from one person to another through skin-to-skin contact, or through contact with an object that has been in contact with a wart. Common warts on fingers normally look like small hard raised bumps, irregular and rough like cauliflower with black or red-brown dots inside. If you have warts which grow around or under the nail plate – they are called periungual warts, a type of common warts. Periungal warts can appear both around the nails of finger and toes. Pop quiz: Anyone knows if Sean Murphy had common wart on his finger, or periungual wart around / under his finger nail plate? Leave a reply with your answer! Even if you possess magical shooting skill with shotgun that is far better than Sean Murphy, it is not worth the risk, as there are certainly better options. Go ahead to check out the comprehensive Warts Removal Reference Guide on this site, covering some of the best ways to treat wart, pro and con analysis of each approach, cost comparison, risks and precautions, key factors of consideration, and so on. Need more detailed guide specifically on finger warts? Here you go, just read on. real life positive / negative Reviews and Results from patients / users based on actual experience. The dermatologist will evaluate and assess your wart on finger and the state of your immune system to determine which treatment is the best for you. The finger wart treatment that the doctor choose may include non-invasive approach or invasive surgical procedure. For those who find physical visit to doctor is time consuming and embarrassing, you could consider engage on-line doctors via established on-line clinics like 121doc and EuroClinix that offer convenience and discretion, to seek first medical consultation. Cantharidin – extract from beetle that causes skin under wart to blister and allow wart to be clipped off. Podofilox gel – available as both a gel and solution for topical application, like Wartec. Imiquimod cream – an immune system booster, such as Aldara cream. If you have a bad case of warts that hasn’t responded to standard treatments, your doctor may refer you for further treatment, including: Bleomycin, Immunotherapy, and Retinoids. Cryotherapy, or freezing, involved removing the warts on fingers with liquid nitrogen or with a very gold probe. Repeat treatments may be necessary before results can be seen. Watch this video demo by Jacob Levitt MD. Laser treatments are also available to remove finger warts, in which the wart is burnt using a laser beam. Types of laser therapy include carbon dioxide laser and pulse dye later, usually requires the use of an anesthetic. Watch Dr Warren Seiler removed a wart from a patient’s finger with his Co2 Laser device in this video. Bleomycin is an anti-cancer drug which is relatively expensive. Bleomycin can be injected into warts, usually requires more than one treatment, and is often a last option for stubborn warts that have been resistant to other treatment methods. Research published by US National Library of Medicine and Unbound MEDLINE concluded Bleomycin injection is safe and effective in treating periungual warts. However, the shots may be painful and can incur side effects like fever and itching, while JAMA Network reported a patient lost his fingernail followed by regrowth of a dystrophic nail after intralesional bleomycin therapy on his periungual wart. 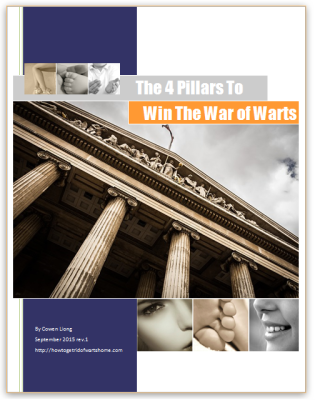 Exclusive: Click here to download a 108 pages evidence-based warts removal guide in PDF document. This FREE guide combines medical research results, user experience, demo videos, pro and con analysis, the recommendations and actionable advice into one-stop epic resource to help you get rid of warts. Over the counter medicines are available to be applied directly on the wart for its removal, with one of the most common active ingredient in OTC medication is Salicylic acid, which often comes in the form of liquid or gel. Research on 240 patients published by The BMJ (formerly the British Medical Journal) concluded Salicylic acid and the Cryotherapy with liquid nitrogen were equally effective for warts treatment. While there are many wart removal products / solutions in the market that you could research when you have the time – here is a popular wart removal creams for your quick reference. 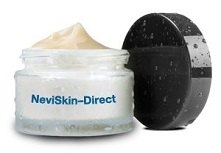 – Formulated with quality natural herbal extracts. – Effective in removing warts, skin moles, skin tags, and syringoma. – Simple application and easy to use at home. – Silver and Gold package purchase deals available for cost saving. – Money back guarantee to any persons not 100% satisfied with the product within 60 days of purchase. Wart removal home remedies are popular, as people like low-cost / natural treatment options and.. to avoid the doctors! For all home remedies lovers, check out recommendations from the natural remedies expert Claire Goodall in her DIY home remedies Everyday Roots Book, or alternatively wart removal solution at home that changed the life of alternative medical practitioner and natural remedies expert Charles Davidson. Take a banana and take off the peel and cut a piece of banana peel. Apply the inner side of the peel directly on the wart and secure the peel over the wart with tape or bandage. The banana peel can be left on for several days. Alternatively, leave it for overnight and take it off in the morning, then repeat the cycle with fresh piece of banana peel. 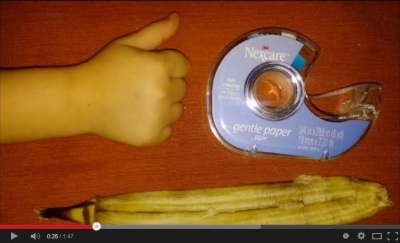 Watch this step-by-step video illustrating home wart treatment with banana peel. Duct tape is a popular home remedies for wart, despite supporters and critics still fight over proving if the method works. The reason of how exactly duct tape works remains debatable, with some people think it could be because the tape prevent the wart’s interaction with air, while other believe the the duct tape may be triggering some immune reaction. The effectiveness of duct tape can be enhanced by applying cream / gel with Salicylic acid together with it. >> Read more on gaffer tape vs duct tape for wart removal. 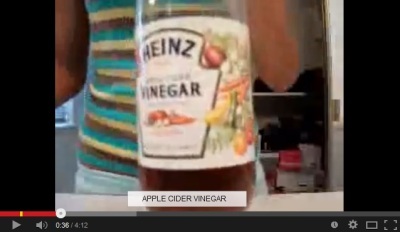 Simply soak the affected area 20 to 30 minutes per day in Apple Cider Vinegar. Soak an appropriately sized piece of gauze or cotton ball in ACV and tape to the wart, preferably before bedtime so the bandage remains in place. Watch below video demo. Alongside boosting your immune system to fight HPV, one of the actionable tips to prevent finger wart is avoid biting fingernails to reduce the chances of developing finger warts and periungual warts. Biting fingernails or hangnails may cause tiny tears in the skin on fingertips, allowing HPV to infect the area and develop warts around the edge of the nail. Therefore you must fight the urge to bite your nails. Kids who bite their fingernails or pick at hangnails tend to get warts more often than kids who don’t because they can expose less-protected skin and create open areas for a virus to enter and cause the wart. 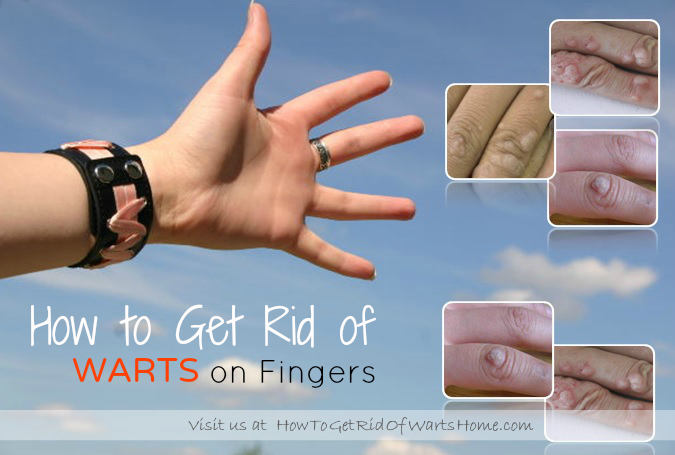 The fact is, even with your best preventive effort, you could still find wart on fingers at some point in your lives. If and when that happens, don’t feel depressed, as you are certainly not alone, and there are solutions. Once finger wart developed, it is important to take below precaution steps to prevent wart from further spread to oneself and others. Do not pick or scratch the wart to avoid wart virus spread to other areas of finger and hand. Cover the finger wart with bandage or athletic tape. Wash your hands thoroughly after contacting wart and caring for the affected area. Do not share personal care item like towel with another person. While most of the wart infections will eventually go away on their own as the wart-causing HPV is cleared by the immune system in most cases, it will take some time. During this prolonged time, wart can affect the patient’s quality of life with discomfort such as pain and itchiness (that may not be tolerated by children), bring psychological impact like embarrassment and self-doubt, and potentially spread to other parts of your body or to other people. As such, it is recommended to treat the finger warts as soon as they appear. This post has covered some of the best ways to remove finger warts, so you just need to put them into action. If you are not sure your skin condition is a wart, or you need further advice to treat your finger wart, then always consult a doctor or dermatologist. For those who find physical visit to doctor is time consuming and embarrassing – no excuse please, you could always engage on-line doctors via established on-line clinics like 121doc and EuroClinix that offer convenience and discretion, to seek first medical consultation. Have You Forgotten This Exclusive FREE Bonus? Click here to download a 108 pages evidence-based warts removal guide in PDF document – combining medical research results, user experience, demo videos, the recommendations and actionable advice into one-stop epic resource to help you get rid of warts. If you like this post, the please share it out and click to LIKE us at Facebook, would you? Thanks! Which finger wart removal option you will pursue? Do you have any finger wart treatment experience to share? Leave a comment below to let us know your thoughts! ← Skin Tag on Eyelid Eyelash Line: How to Remove Tags Around Eyes? I have been fighting a wart on my thumb cuticle for almost 30 years. I have spent thousands of dollars. that my insurance will not pay for. With each treatment , the wart comes back with super powers. Does anyone have a REAL CURE? This is so fustrating. Please give me a true cure. Sorry to hear that you’ve been fighting wart for ~30 years without success. I’ve dropped you an email with my comments and recommendations – hope it helps. Wishing you good luck and all the best to get rid of your warts on thumb soon!